In a world filled to the brim with absurdity, it is remarkable that we’re somehow still talking about Rachel Dolezal—the white woman who masqueraded for years as a black person. It’s been nearly two years ago her facade fell and since then we’ve been inundated with absurd headlines about her identification as trans-racial, her laughable name change, and her book deal. With a new profile in the Seattle alt-weekly, The Stranger, we finally have a nuanced and appropriately-biting picture of this enigma of a woman who comes as repugnant and unbalanced enough that we can hopefully leave her in the past for good. When the Rachel Dolezal story first broke, I can count myself among those who initially found a great deal of humor in the scenario. Did this white lady really think she looked black? How many people were truly fooled by her nonsense? I couldn’t believe the lengths she went to to keep up the charade and was even impressed, if not slightly horrified, with her commitment to this delusion. Still, as time passed and she attempted to segue her infamy into actual fame, the humor wore off. Here was an obviously white woman still insisting she fully understands and lives the experience of black people and, worse, was attempting to profit off of it. Ijeoma Oluo, Editor at Large at The Establishment, flew to Spokane to speak with Dolezal and produced the best and most revealing profile of a woman who, as it turns out, isn’t all that compelling or complicated when closely examined. Though there may have been, I can’t think of a single interview conducted by a black woman who was able to so successfully push back against Dolezel’s inane arguments and justifications. Oluo is able to wrangle the whole mess of Rachel Dolezal down to a classic case of white privilege and brilliantly weaves this thread throughout the piece. Dolezal comes off as immediately defensive—perhaps due to being challenged for the first time in a serious way by someone who is obviously more adept than she. One of the most frustrating and offensive arguments she makes throughout the interview is the notion that because she is a “scholar”—because she has studied black history and race—she somehow has a better understanding of racial identity and blackness than actual black people. It should be noted, this is a woman with a degree in art history who posed as a professor of black history and, as Oluo notes, inexplicably fancies herself better informed than people who have read all the same books she has. The dismissive and condescending attitude toward any black people who see blackness differently than she does is woven throughout her comments in our conversation. It is not just our pettiness, it is also our lack of education that is preventing us from getting on Dolezal’s level of racial understanding. 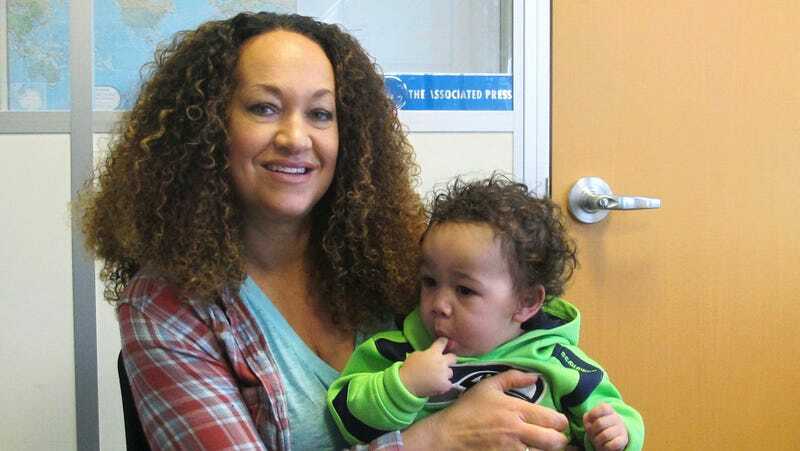 One of her most unhinged positions is Dolezal’s insistence that she’s some sort of race revolutionary—that she is expanding and distorting our previous notions of what black and white can be. Oluo swats down this ridiculous assertion as well as the notion that race can be fluid in a way that would help anyone other than white people. Even if there were thousands of Rachel Dolezals in the country, would their claims of blackness do anything to open up the definition of whiteness to those with darker skin, coarser hair, or racialized features? The degree to which you are excluded from white privilege is largely dependent on the degree to which your appearance deviates from whiteness. You can be extremely light-skinned and still be black, but you cannot be extremely or even moderately dark-skinned and be treated as white—ever. Dolezal’s ability to even continue this fantasy—to decide what race she is—is a product of white privilege and her inability to see that lies in a rabid belief in her own wokeness and intellectual prowess, or, white supremacy. And it is white supremacy that told an unhappy and outcast white woman that black identity was hers for the taking. It is white supremacy that told her that any black people who questioned her were obviously uneducated and unmotivated to rise to her level of wokeness. It is white supremacy that then elevated this display of privilege into the dominating conversation on black female identity in America. It is white supremacy that decided that it was worth a book deal, national news coverage, and yes—even this interview. So much credit, again, must be given to Oluo, who fact checks and reports at the same damn time, never letting Dolezal get away with dropping a myopic argument without challenge. Like many people who try to hang their hat on weak arguments, Dolezal often seems to deliberately miss the point of a question because she knows she doesn’t have a good answer. It’s a tactic that may have worked well when facing the women of The Real or a white man looking for a splashy story, but here it only serves to underline her folly. Dolezal is simply a white woman who cannot help but center herself in all that she does—including her fight for racial justice. And if racial justice doesn’t center her, she will redefine race itself in order to make that happen. One of the most telling anecdotes in the story occurs when Oluo asks Dolezal to switch seats to improve the composition of a photo—moving Dolezal into the light since she’s the main subject of the image. Perhaps Rachel Dolezal, like most of us, is worn down by the endlessly exasperating nature of her story. As much as she may have brought this all upon herself, she is still unable to hold down a job and support her family and she’s clearly bitter about how she was, and continues to be, portrayed. Still, she has, time and time again, squandered opportunities to show at least a shred of self-awareness or compassion for the black woman who feel she has co-opted and made a mockery of an identity she can never truly know. She has never really been worth defending and now, hopefully we can all agree Rachel Dolezal is also no longer worth covering. What Is Rachel Dolezal Trying to Achieve?